sites, ensuring a dust and odour free environment. 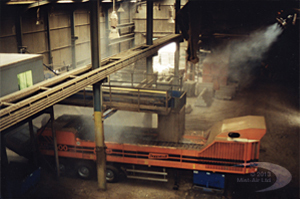 mist-air in Action controlling dust from an indoor, high speed Dopstadt wood shredder. 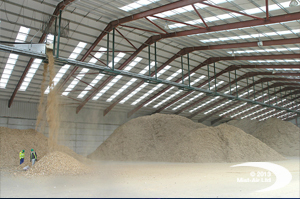 This biomass storage facility shifts hundreds of tons of woods chippings. Without mist-air the dust would make the conditions unworkable. The wood fuel for biomass energy goes through many processes. mist-air keeps it safe for staff at every stage. mist-air has the flexibility to suppress dust and odours in areas where extraction is simply not possible or affordable. Currently mist-air is used in thousands of manufacturing and recycling applications, suppressing dust from wood, brick, soil, cement, paper, gypsum, ash, glass, biomass, coal, etc. using only water. Extremely fine fog is blown by stainless steel fans into the air, suppressing rising dust and preventing it from becoming airborne. 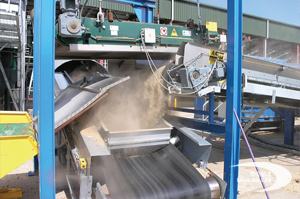 Dust particles are attracted to the fog, causing them to settle, and prevent them from staying airborne, so is ideal for stopping dust created during tipping, hopper loading, shredding, trommels, screens, air knives, conveyor transfer points, bulker loading etc. Floors, machinery and stock, stay completely dry and personnel can work in the fog without becoming wet. One mist-air Base Unit (1200mm x 900mm x 600mm ) will supply several areas or buildings simultaneously, with precise control over each area, delivering just as much, or as little fog as is required for any given application. Water and power usage is very low and an entire building can be treated with just a few litres of water per hour. 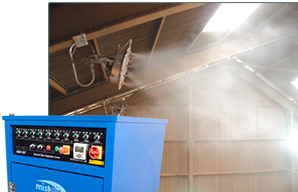 This system can also deliver an odour absorbing solution into the fog, for odour control. All wetted parts are manufactured from stainless steel or non-ferrous materials which ensure corrosion free operation, coupled to a 20 year corrosion warranty. Normally installed within two days, with a low purchase and maintenance cost, and hire or lease is also possible. (h: 1200mm x w: 900mm x d:600mm) which supplies controlled quantites of dry fog across many zones,as and when required. The mist-air System MUST NOT to be confused with "fog cannons, rotary atomisers, or lines of misting nozzles in the roof"